Normally, I don't let the gas tank get to where the light comes on. But, knowing that I was getting paid this week, I didn't spend any money on gas until Tuesday. My 16 gallon tank was quite low. This is the most I've ever spent on a fill-up. Regular was $3.99 a gallon. It has since dropped to $3.89 in advance of the holiday. 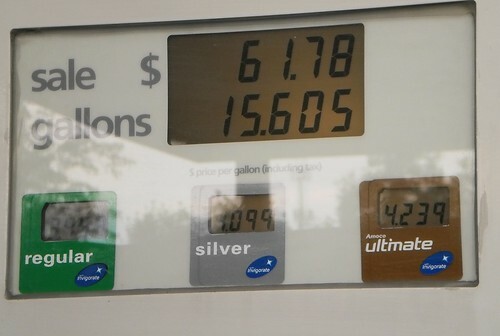 I know some of you reading this will say, "Gee, I WISH a fill-up was $62." This is a lot out of my budget. I will be adding gas when it gets to half or 3/4. I can't afford a hit like that all at once. I'm a big one for consolidation of errands and doing them all at once. There will be more of that and much more of the, "Do I really NEED to go get that? Can I do without it?"